Jimmy Butler scored 33 points on 10-of-12 shooting during his first home contest of the season to help the Minnesota Timberwolves post a 131-123 victory over the Cleveland Cavaliers on Friday night in Minneapolis. Butler was heartily booed in pregame introductions, stemming from his trade request and vow not to re-sign with the Timberwolves. He hit all 12 of his free throws and also contributed seven rebounds and four steals in 36 minutes. Andrew Wiggins added 22 points and Taj Gibson had 13 points for Minnesota (1-1), which shot 50.6 percent from the field and made 33 of 35 free throws. Four other players scored in double digits: Karl-Anthony Towns and Derrick Rose each scored 12 points, and Gorgui Dieng and Anthony Tolliver had 11. Kevin Love had 25 points, 19 rebounds and seven assists for the Cavaliers (0-2). Cedi Osman recorded 22 points and eight assists, Jordan Clarkson scored 19 points while Collin Sexton and Tristan Thompson (10 rebounds) had 14 points apiece. Rodney Hood (10 points) also scored in double digits for Cleveland, which shot 48.4 percent from the field and made 25 of 29 free throws. Minnesota held a 104-95 lead entering the final quarter before Butler knocked down a 3-pointer to push the lead back to 12. 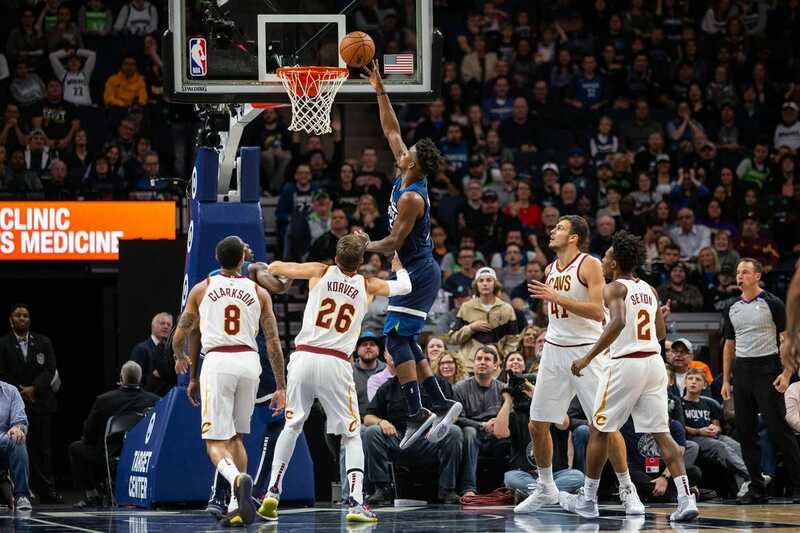 Sexton later scored four straight points to help the Cavaliers move within six before Dieng tallied five points during a 7-0 run to give the Timberwolves a 116-103 lead with 8:45 left. Sexton continued to energize Cleveland and his length-of-court dash for a layup pulled his team within 121-117 with 4:02 remaining. The Cavaliers couldn't get closer and Butler drained a jumper to make it a six-point margin with 24.2 seconds left, then added two free throws with 13.5 seconds to go to close it out. The Timberwolves led by 17 at halftime and stretched their lead to 83-62 on two free throws by Jeff Teague with 8:13 remaining in the third quarter. Osman nailed a 3-pointer to pull the Cavaliers within 93-86 with 2:32 left in the quarter. Wiggins scored 16 points and Butler added 12 as Minnesota led 71-54 at the break. The Timberwolves used a 19-7 surge, capped by back-to-back dunks from Butler, to open up a 55-41 lead with 5:56 left in the half. The advantage reached 20 at 67-47 when Wiggins converted a three-point play with 2:36 remaining.